I used to love Instagram. When it first came out I used it all the time and thought it was a great way to share my food photos and I quickly gained over 3,000 followers. Now it seems to be a little bit of a waste of time. It doesn't create any blog traffic the way that Pinterest does (Pinterest is awesome for blog traffic! ), interaction is at a minimum, and there seems to be a large number of 20 year old girls taking photos of themselves in bikinis. Now I could rock a mean looking bikini if I wanted to, but that isn't something that at 36 I feel the need to want attention for doing. I think social media is stuck at a crossroads. One can only take so many selfies, be they making duck faces for Facebook, or full body bikini shots for Instagram, before the saturation point is reached. Then what. I think Instagram is at that point. How does it move from an over abundance of people taking photos of every little thing they ate and the full body bikini shot of them doing it, to something that can actually be of use to anyone from a business or professional point of view. In the mean time I refuse to start taking photos of myself holding a pie in a skimpy bikini for more likes. My family is obsessed with pork. If my husband and two kids had their way we would pretty much eat pork everyday. While I love pork, I try to minimize the amount of pork, beef, and lamb that my family eats, so we only eat red meat approximately once a week. When we do eat pork it's normally in the form of pork tenderloin or bacon. 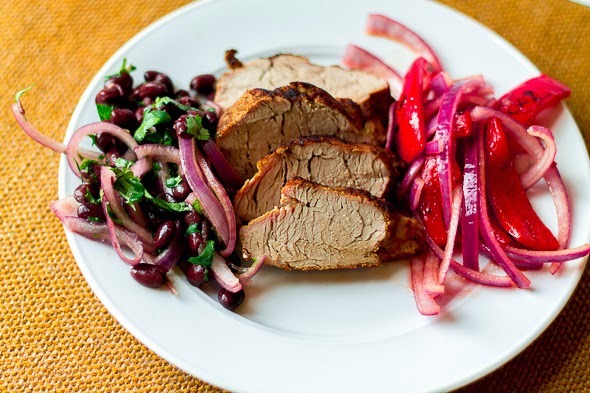 The following is a recipe for Cumin Pork with Adobo Black Beans and Red Pepper Salad. Recipe adapted from the Food Network Magazine. 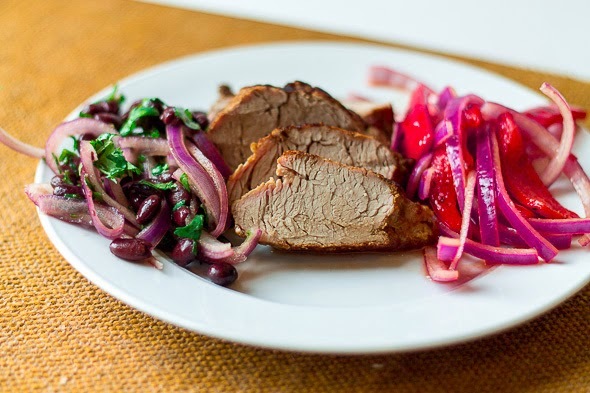 In a small bowl combine half of the sliced red onion with the juice of 2 limes, `1/2 teaspoon cumin, a pinch of salt, and the chopped chipotle. Heat a skillet over medium heat with 1 tablespoon of olive oil. Rub the pork with 1 1/2 teaspoons of ground cumin. Add the pork to the skillet and brown on all sides. Roast pork on a baking sheet in a 425 degree pre-heated oven for 15-20 minutes (or until the temp reaches 145 degrees). Transfer to a cutting board, cover with foil, and let the pork rest for 10 minutes before slicing. Add 1 tablespoon olive oil and the red peppers to the skills that the pork was browned in. Cook the pepper for approximately 4 minutes, or until slightly softened. Add 1/4 teaspoon salt and 1/2 cup water. Cook until the water evaporates, approximately 4 more minutes. Add to the onion mixture in the bowl. Add the black beans to the remaining red onion, 2 teaspoons adobo sauce, honey, 1/4 teaspoon salt, cilantro, and juice of one lime. 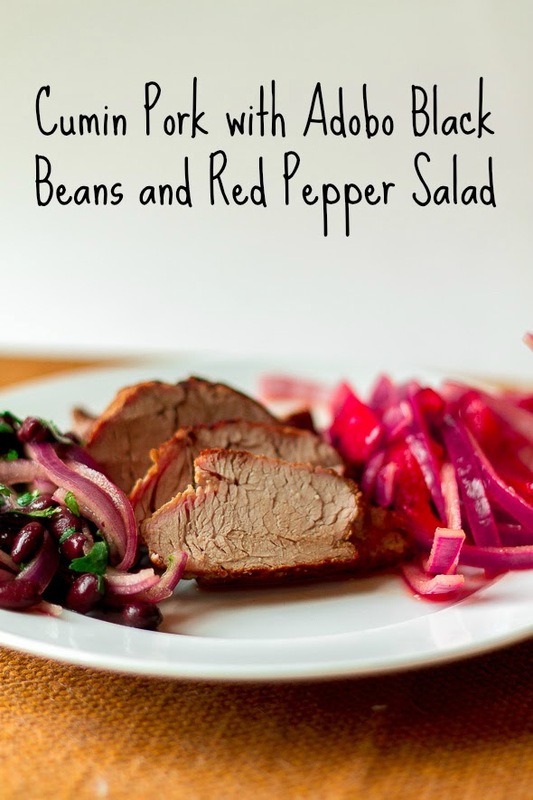 Serve the beans, peppers, and sliced pork together. You can substitute cooked beans for the canned. 1 1/2 cups of cooked beans is approximately equivalent to a 15 ounce can. If you don't use olive oil, canola, sunflower etc. can be substituted. Don't cut the cilantro until right before you are going to use it. Cilantro starts to lose flavor as soon as it's cut. That's why it's best to chop cilantro right before it is added to salsas etc. Cilantro is not one of the herbs that you want to pre-prep, just don't do it.